Court Jester Goby (Koumansetta rainfordi - Syn: Amblygobius rainfordi), is also commonly known as Rainford's Goby or Old Glory Goby. The court Jester Goby is one of the best choices of species for starting salt-water aquarists. Its body is colored green and blue, and has horizontal orange stripes that run along its entire body. It has a timid and peaceful temperament that makes it a perfect addition to either reef or fish-only aquarium. This type of fish grows to about 2.5 inches in length, and is not a threat to any invertebrate inhabitants in the tank. Being a meek fish, it would appreciate several hiding spaces found within poly coral colonies. Initially, Court Jester Gobies would be picky eaters and need to be trained on eating prepared food in the tank. 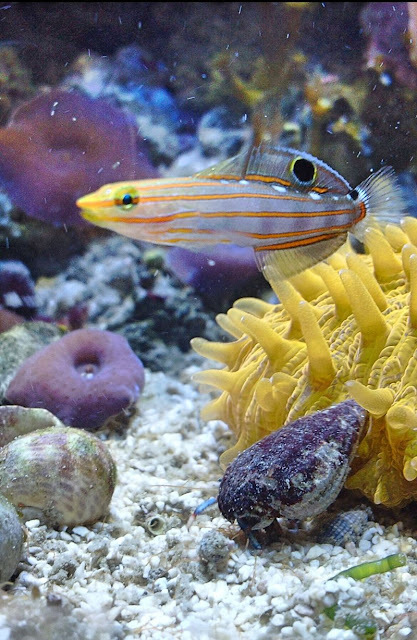 Once introduced to the main tank, however, most Court Jester Gobies will graze on the algae that has formed on rocks, and will start eating prepared foods it is given. To keep its color, a diversified diet of mysid shrimp, brine shrimp, or enriched marine food should be given to the fish daily. As it feeds on shrimps , you may want to opt out of this fish if you prefer to have a cleaning shrimp inside the tank. It does not do well with other aggressive and larger fish, as well as other Court Jester Gobies in the tank. It needs a tank size of at least 10 gallons to roam freely. It propagates by laying eggs, and will readily spawn in captivity. You can by Court Jester Goby for $25 per fish. Quarantine of 2-3 weeks is a must to prevent contamination of your salt-water aquarium.